Material. BMNH C6410b (the original ofWoodward 1851-1856, p. 96, fig. 58; p. 210, fig. 65), BMNH C37027 (ex Tesson Collection, mentioned by Spath 1953, p. 17), both from Fresville; BMNH 48763, without precise locality data, C70643 and C70644 (ex J. Sowerby, ex de Gerville Collection) from Valognes; MHNG, six unregistered specimens from Valognes; NHMW 7479 from Orglandes; FSR 4-6 from Ste Colombe; EMP unreg., unlocalized (two specimens); MNHP R1204 (ex de Vibraye Collection, 1896-1927) from Valognes, R1203 from Golleville, R1206 from Fresville; MNHP d'Orbigny Collection 7203 from Ste Colombe. curved portions that show shell to have consisted of at least two subparallel shafts, possibly three. Smallest specimen has whorl height of 21•9 mm and is part of curved portion; largest, straight portion has whorl height of51 mm. As can be seen from table of dimensions, whorl section varies from compressed to near equidimensional, with whorl breadth to height ratio of 0•89 to 0•99. Sections vary from oval with venter only slightly narrower than dorsum to distinctly ovoidjrounded subtrigonal to nearly circular. Internal moulds vary from virtually smooth (pI. 4, figs. 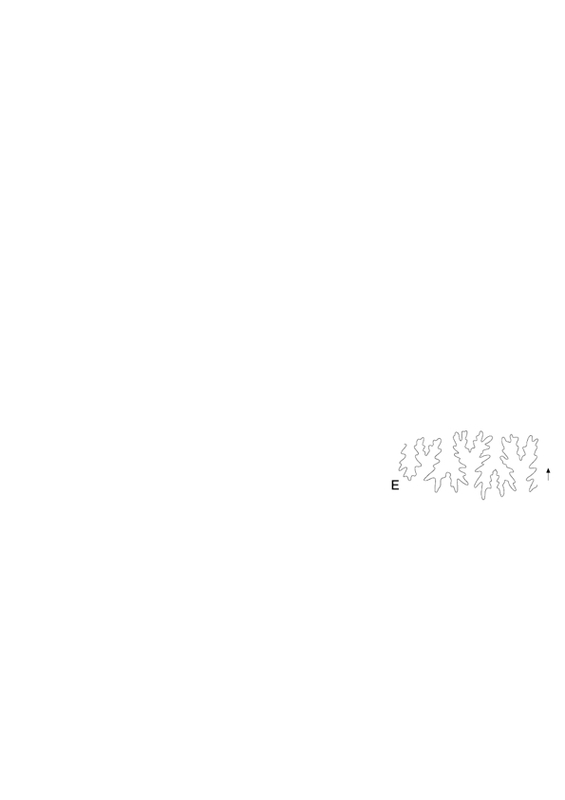 land 2; PI. 9, figs. 8-10) to faintly (PI. 10, figs. 3 and 4) to distinctly (if'subduedly) ribbed (text¬fig. 6A-C). Rib direction on straight portions varies from almost rectiradiate (pI. 10, figs. 3 and 4) to markedly prorsiradiate (text-fig. 6A-C) even on same specimen (text-fig, sn, E). It varies from prorsiradiate to rectiradiate around hooks. . Where extemal ornament is preserved, ribs are annular, narrow, sharp, and separated by much wider interspaces (text-fig. ön, E; PI. 10, fig. 3); rib index varies from II to 13 on one specimen and between the three specimens where ornament was visible. Oecasional feeble grooves on moulds appear to be strengthened interspaces or incipient constrictions. There are also distinct rugations on surface corresponding to apertural end of sutures in some specimens. Suture line is deeply and intricately subdivided (text-fig. 7G-M). Description: The specimens are short straight fragments of the juvenile phragmocone. The 1argest and best preserved individual (Text-fig. 13H) has an oval cross section with broad1y rounded flanks, and narrow1y rounded dorsum and venter. A thin 1ayer of the test is preserved so that the ornament is faintly visible. On the test ribs are dense and rectiradiate in the dorsal area but slightly retracted on the flanks to cross the venter at an angle of c. 80 degrees. The rib index is c. 12 for the 1argest individual. The suture 1ine is visible on the smaller specimen illustrated (Text-fig. 13G). It is deep1y incised with symmetrica1 bifid lobes and sadd1es. E is slightly extended and surrounded by high sadd1es; the sutura1 elements are lower towards the dorsum. Description. -GSP 1062: 47 mm long straight fragment of phragmocone with replaced shell (Fig. 12.1, 12.2). Maximum preserved whorl height 24 mm; whorl breadth to height ratio 0.88. Whorl section ovoid, with dorsum more broadly rounded than venter. Adapertural end of fragment ornamented by crowded narrow ribs; rib index 21. Ribs transverse on dorsum, projected forwards on dorsolateral margin, straight and markedly prorsiradiate on flanks, strengthening on outer flank, transverse on venter. Adapical end of fragment with similar but coarser ribs, separated from fine-ribbed sector by deep, narrow constriction, parallel to and flanked by collar-ribs. GSP 1063 (Fig. 12.312.5): curved fragment with recrystallized shell preserved; 53.5 mm long, whorl breadth to height ratio 0.78. Ornament as in previous specimen, but modified to accommodate curvature. Partial corrosion of replaced shell material shows internal mold is smooth. Sutures not seen. Type.-Neotype, designated by Kennedy, 1987, p. 183, is no. 10511 in the collections of the Institut Royal des Sciences Naturelles de Belgique, from the Upper Maastrichtian of St. Pietersberg, Maastricht, The Netherlands, figured by Kennedy, 1987, pl. 24, figs. 1-3. DESCRIPTION.- BMNH C51102 (Pl. 6, figs. 1-3), the original of Kossmat (1895, pl. 19 (5), fig. 9), a syntype of Hamites rugatus Forbes, 1846, is an initially slightly curved, thereafter straight shaft, 180 mm long, with a whorl breadth to height ratio of 0.86 at the smaller and 0.85 at the larger end, where the maximum preserved whorl height is 28 mm. The flanks are broadly and evenly rounded, the dorsum and venter more narrowly so, with an oval whorl section. The specimen is partially septate. Ornament is subdued on the mould, but sharp where shell is preserved. The rib index is 12-13, the ribs transverse on dorsum and venter and varying from feebly rursiradiate to feebly prorsiradiate on the flanks, and only slightly weaker on dorsum than venter. Where well-preserved, they are narrower than the interspaces, with blunt crests. BMNH C51101 (Text-fig. 3; the original of Kossmat 1895, pl. 19 (5), fig. 8) is a wholly septate fragment of a shaft and part of the curved sector, with a maximum preserved whorl height of 40 mm on the shaft close to the curved sector, where the rib index is 14-15, the ribs markedly inclined on the flank. The whorl breadth to height ratio cannot be determined. Even larger is an unregistered fragment of straight shaft, with a whorl height of more than 50 mm. Suture (Text-fig. 1B) with deeply incised symmetrically bifid lobes and saddles. Description.- Common in the Biscay sections; nearly complete specimens consist of up to three subparallel shafts. Adult whorl height up to 1 10 mm at aperture of body chamber. Coiling diplomoceratid, whorls slowly expanding. Being preserved as composite molds, specimens retain ribbing. Ribs sharp, narrower than interspaces, annular, and somewhat weakened on dorsum where transverse or feebly convex. Ribs straight and recti- to feebly prorsiradiate on the flanks of shafts, but on hooks they crowd together and change from prorsiradiate to rectiradiate. Rib index varies from 15-1 7 on medium-sized fragments but increases on body chambers to as much as 30 at aperture, where ribs become markedly prorsiradiate, sometimes feebly convex and may weaken progressively. Discussion. As deseribed here, the Caleaire ä Baculites material is eharacterized by a variable but never depressed ovoidjrounded to subtrigonal to nearly eireular whorl seetion and a rib index of II to 13 on the three specimens where this was measurable, D. cylindraceum lvovense Mikhailov, 1951 (p. 42, pl. 2, figs. 7 and 8; text-fig. lla, b), the holotype ofwhieh is the original ofNowak (1913, p. 382, pl. 41, fig. 10) co-occurs with such forms in several parts of Europe, and is here regarded as a synonym. Mikhailov's figure (1951, text-fig. lla, b) shows a distinctly eompressed, ovoid seetion, but this is due to post-mortem deformation. 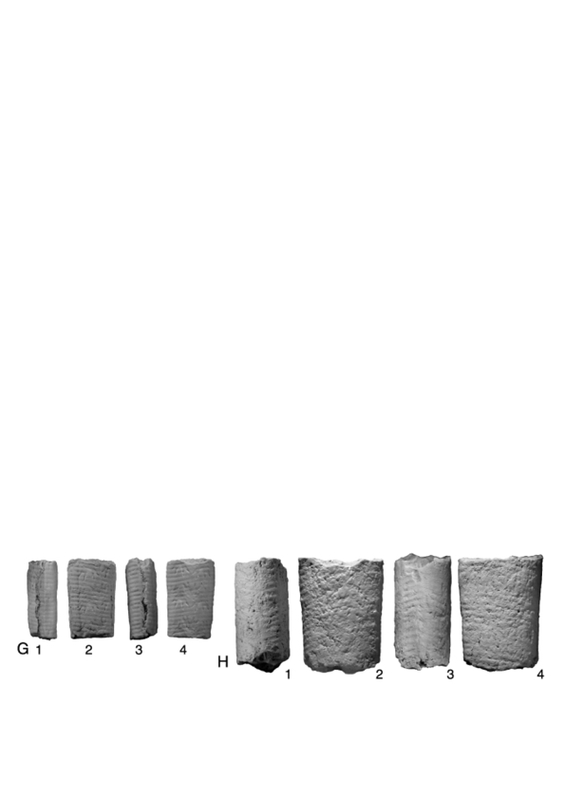 The rib index (16-17) is higher than the material described here but the Cotentin sample is so small that this is not considered signifieant. I ean see even less difIerenee between D. cylindraceum and the Antarctie D. lambi Spath, 1953 (p. 17, pl. 2, figs. 1-3). Spath difIerentiated them (so far as one ean judge) on whorl seetion, eompressed in cylindraceum and eireular in lambi, and details of suture. On examining the BMNH type series, moulds of phragmoeones are smooth to faintly ribbed, but moulds of body-ehambers bear strong ribs. The rib direetion varies as in the French material. The whorl breadth to height ratio of eight unerushed speeimens varied from 0•95 to 1,06, with five specimens slightly compressed and four slightly depressed. The rib index, measurable on only three specimens, was 13, 14, and 17. D. notabile Whiteaves, 1903 (p. 335, pl, 44, fig. 4; holotype refigured by Usher 1952, pl, 29, fig. 2) has, according to Whiteaves, a whorl breadth to height ratio ofO•8 at a whorl height of 47 rnm and 0•84 at 55 mm, thus being more eompressed than any ofthe present specimens, and with a slightly higher rib density. BMNH C3486 and C41424 had whorl breadth to height ratios of 0•87 and 0•90 and rib indices of 14 and 12 respective1y. Alaskan examples (Jones 1963, p. 32, pl. 21, tig. 1) have whorl breadth to height ratios ofO•80 to 0•89 and rib indices of 11 or 12. Usher was impressed by the sutural difIerences between D. cylindraceum, as illustrated by d'Orbigny, and D. notabile, pointing to the greater degree of incision in the Canadian form, espeeially the degree of incision of the external saddle. It is, at most, subspecifically distinct. Hamites elatior Forbes, 1846b is based on an inadequate deseription, the types being lost. H. hampeanus Hauer, 1847 is a clear synonym, as Hauer pointed out in 1858 (p. 8, pl. 1, figs, 3-6). The H. elatior ofWhite (1890, p. 13, pl. 2, figs. 1 and 2)has a eompressed, paralle1-sided whorl seetion and a rib index of 20, but White states it to be crushed. It resembles the finely ribbed speeimens ofKilian and Reboul (1909, pl. 4) and Weller (1903). Eudiplomoceras raggati Brunnschweiler, 1966 (p. 18, pl. 8, fig. 7; text-figs, 4 and 5) is a further synonym. The inadequately deseribed Di jimboi and D. oshaugnessyi of Anderson (1958) are doubtfully referred to the present speeies. D. australe Hunieken, 1965 (p. 67, pl. 4, figs. 1-4) has a whorl breadth to height ratio ofup to 1•6 and seems distinct enough on this eriterion. Remarks: The suture line of the early juvenile specimen is little incised. Elements correspond to Diplomoceras cylindraceum (Defrance) as well as shell ornament, and the cross section is within the wide range of possible WB/WH ratios (see Kennedy and Henderson 1992a) known for the species. Occurrence: Diplomoceras cylindraceum ranges throughout the Maastrichtian, with records from France, Spain, Italy, The Netherlands, northern Germany, Denmark, Poland, Austria, the Ukrainian SSR, Arctic Siberia, Bulgaria, South Africa, Madagascar, Chile, Argentina, Brazil, California, British Columbia, Japan (jide Ward and Kennedy 1993), southern India (Kennedy and Henderson 1992a), western Austra1ia (Henderson et al. 1992), the Antarctic Peninsula (Olivero and Zinsmeister 1989), and A1aska (Jones 1963). Hence, it is a cosmopolitan Maastrichtian species which is known in all1atitudes from A1aska to Antarctica. Discussion.-The observation that the internal mold is smooth, the ribs limited to the external surface of the shell, shows these specimens to be Diplomoceras rather than Glyptoxoceras Spath, 1925 (see Kennedy, 1986; 1987; Henderson, Kennedy and McNamara, 1992). The fib index falls within the range recognized in Diplomoceras cylindraceum (Defrance, 1816), while the distinctive constriction of GSP 1062 can be matched in a specimen from the Upper Maastrichtian of western Australia figured by Henderson, Kennedy and McNamara (1992, fig. 5ab). The fragments are rather compressed, but fall within the range of topotype material analysed by Kennedy (1987, p. 184, fig. 10), and south Indian material (Kennedy and Henderson, 1992b, pl. 6, figs. 1-3). TYPE.- Neotype, designated by Kennedy (1987, p. 183, pl. 24, figs. 1-3), is no. 10511 in the collections of the Institut Royal des Sciences Naturelles de Belgique, from the Upper Maastrichtian Nekum or Meersen Chalk of St. Pietersberg, Maastricht, The Netherlands. DISCUSSION.- Kennedy (1987) described a suite of more than 70 specimen from the type area in The Netherlands, as well as a smaller suite of well-preserved specimens from the Calcaire a Baculites of Manche, France (Kennedy 1986b). Kennedy and Summersberger (1986) described the type material of Hamites hampeanus Hauer, 1847 (p. 75), a synonym, and Kennedy and Summersberger (1987) described material from Lvov in the Ukraine, showing the variety Ivovensis of Mikhailov (1951) to be based on crushed specimens of D. cylindraceum. These workers considered D. cylindraceum to be widely varying species in terms of whorl breadth to height ratio and rib index, encompassing both Diplomoceras notabile Whiteaves, 1903 (p. 335, pl. 44, fig. 4), originally described from British Columbia, and D. lambi Spath, 1953 (p. 17, pl. 2, fig. 1-3), originally described from Antarctica. Olivero and Zinsmeister (1989) in seeming ignorance of the description of the neotype of cylindraceum, as well as other topotype material, held D. lambi, D. notabile and a new species, D. maximum Olivero and Zinsmeister, 1989 (p. 629, text-figs. 2.5, 4.1-4.5, 5.1-5.4) to be different from D. cylindraceum. According to these authors, the diagnostic features of these species include: D. lambi, circular whorl section and rib index of 13-20; D. notabile, compressed whorls, and slight sutural difference; D. maximum, circular whorl section, rib index ranges from 9 to 13, average 11-12. For D. cylindraceum they quote Kennedy (1986b) and Kennedy and Summersberger (1986) as indicating a rib index of 11-13. In fact material from The Netherlands (Kennedy 1987) has whorl breadth to height ratio of 0.77-1.02, and a rib index of 15-17 at whorl heights of 55-60 mm, and up to 20 or more in the largest fragment. Text-figure 4 plots the whorl breadth to height ratio of type material of all these species, additional specimens from The Netherlands, the Calcaire a Baculites of the Cotentin Peninsula in France, and the Indian examples. The whorl section of the neotype of D. cylindraceum and the holotype of D. notabile are both compressed. Whiteaves (1903) gives ratio of 0.81 at the smaller and 0.84 at the larger end of the holotype. The rib index is 15, so that the specimen falls within the range of D. cylindraceum. The types of D. lambi in the collections of The National History Museum have a whorl breadth to height ratio of 0.95 to 1.06, overlapping that of D. cylindraceum, as does the rib index of 13, 14 and 17. The larger suite described by Olivero and Zinsmeister (1989) with a rib index of 13-20 and circular cross section also overlaps with the topotype assemblages and other European material. There are thus no grounds for separating these in species in our view. D. maximum cannot be differentiated from D. cylindraceum on whorl section, showing a whorl breadth to height ratio that varies from 0.79-1. The rib index is as low as 7 in specimens with a whorl height of 10 mm, but varies up to 15 at a whorl height of 16 mm, and is generally between 10 and 13 in larger specimens. To us it appears to be no more than the paucicostate part of a population which clearly overlaps with European material. Indeed, the plot of rib index versus whorl height in Olivero and Zinnsmeister (1989) shows what is to us an arbitrary separation between D. maximum and D. lambi; taken together, the overlap with European D. cylindraceum is even more obvious. We see no grounds for treating all of the forms discussed here as anything more than a variable D. cylindraceum. Hamites indicus d’Orbigny, 1847a (pl. 3, figs. 13-14) is shown as a 22 mm long fragment with a compressed whorl section and feebly prorsiradiate narrow, straight flank ribs, the rib index being 14, and may well be a juvenile D. cylindraceum. OCCURRENCE.- Where well dated, this species is Maastrichtian, ranging to the very top of the stage. There are records from south India, Japan, Alaska, British Columbia, California, Chile, the Antarctic Peninsula, Western Australia, Madagascar, Zululand (South Africa), the USSR, Italy, northern Spain, France, Belgium, The Netherlands, Germany, Denmark, Poland, Austria, Bulgaria, and, possibly, New Zealand, Greenland and Brazil. A slightly lower appearance, in the Upper Campanian, is suggested by records from Japan (Matsumoto and Morozumi 1980; Matsumoto 1984; Matsumoto and Miyauchi 1984). Type.- Neotype, designated by Kennedy, 1987, p. 182, is No. 10511 in the collections of the Institut Royal des Sciences Naturelles de Belgique (Kennedy, 1987, Pl. 24, figs. 1-3) from the upper Maastrichtian Meerssen Chalk of St. Pietersberg, Maastricht, the Netherlands. Discussion- There are three widely cited Diplomoceras species, but study of large suites of specimens suggests that Diplomoceras notabile Whiteaves, 1903 (p. 335, Pl. 4, fig. 4) and D. lambi Spath, 1953 (p. 17, Pl. 2, figs. 1-3, Pl. 3, fig. 1) are synonyms of cylindraceum, as are other, less widely cited species listed by Kennedy (1986c, 1987), to which reference should be made. Olivero and Zinsmeister (1989) recently separated Diplomoceras cylindraceum, D. notabile, and D. lambi, and added a new species, D. maximus. They were unaware of the description of material from the Maastricht area or of the designation of a neotype of D. cylindraceum by Kennedy (1987). This material and that from western Australia described by Henderson, Kennedy, and McNamara (1992) show that all of these nominal species fall into the range of a variable D. cylindraceum. Occurrence. - In the Biscay sections, the taxon ranges from Member I (lower Maastrichtian) to the top of Member V (upper Maastrichtian). Elsewhere, the species ranges throughout the Maastrichtian, with records from Pyrénées-Atlantiques and the Calcaire à Baculites of the Cotentin Peninsula, Manche, France, northern Spain, Italy, the Netherlands, north Germany, Denmark, Poland, Austria, the Ukrainian SSR, Arctic Siberia, Bulgaria, Zululand, South Africa, Madagascar, south India, western Australia, the Antarctic Peninsula, Chile, Argentina, Brazil, California, British Columbia, Alaska, Japan, and, perhaps, Greenland and New Zealand. 1951 Diplomoceras cylindraceum var. Ivovensis Mikhailov. - Mikhailov : p.42 pl. 2, figs. 7 and 8; text-fig. 11a, b var. nov.
1976 Diplomoceras cylindraceum Defrance. - KLINGER : 81 et seq. 1993 Diplomoceras cylindraceum Defrance. - Hancock & Kennedy : p.164 pl. 15, fig. 15; pl. 17, figs. 1-4. 1993 Diplomoceras cylindraceum Defrance. - BIRKELUND : p.51 pl. 3, figs. 3, 4; pl. 9, fig. 1; pl. 11, figs. 1-5 @ pl. 12. In: Geological observations on South America Eds: Darwin, C.. p. 279 pp. Paléontologie, Pls. 1-6 (Geologie Pls. 4-9). In: M. de Dumont D'Urville, 1846-1 854, Voyage au Pole Sud et dans I'Oceanie sur les corvelles L'Astrolabe et la Zelée pendant les années 1837- 1838-1839-1840 sous le commandément de M. Dumont D'Urville Capitaine du Vaisseau. Pls. 1-9 Eds: Baudry, G..
1851-1856. A manual of Mollusca. p. xvi+486 pp. Monographie des gastropodes et des céphalopodes de la Craie Supérieure du Limburg. Description des Mollusques fossiles de la Craie des environs de Lemberg en Galicie . p. 187 pp. 1871-1876. Cephalopoden der oberen deutschen Kreide. . Palaeontographica21-24 p. 21, 1-24, pis. [Upper Cretaceous ammonites from the southern part of european Russia and their importance for zonal stratigraphy (Campanian, Maastrichtian).] [In Russian.] . Trudy Inst. geol. Nauk Mosk.129 (Geol. ser. 50) p. 143 pp. Sobre la presencia de Diplomoceras lambi Spath en la Isla Vicecomodoro Marambio . Inst. Antarct. Argent. Vol. 191 p. 40 pp. In: Cretaceous-Tertiary Boundary, The Maastrichtian and Danian of Denmark Eds: Events Symposium, 1.. p. 210 pp. Cephalopods from the Shimanto belt of Kochi Prefecture. [The fossils of Bulgaria Va Upper Cretaceous.] [In Russian.] . p. 136 pp.